Seriously. I’ve been dying to try this foundation. So you can imagine how excited I was when I received* this product to test it. I’ve already announced in October that I’m going to try this product by Laura Mercier, which is the Flawless Fusion Ultra-Longwear Foundation. The reason why I’m only posting my review on this very day is simple: When doing reviews I just really wanna make sure that I use the products long enough to have a solid opinion about it, make sure to write down my personal pros and cons, wear products on different occasions and just make sure that I have everything covered. The Laura Mercier Flawless Fusion Ultra-Longwear Foundation promises to be obviously a long wear foundation. The reason why I knew I could take a shot on it was that it claims to be good for all skin types including sensitive skin. Check. It’s supposed to make it through a 15 hour day. Further it’s oil-free, transfer resistant, has a matte finish and claims to be medium to full coverage. Sounds fantastic so far right? I had high expectations on this foundation as I only heard good things about it and not because it’s on the pricey side. I already tried foundations that were high-end but were just too harsh and would aggravate my skin or give me acne. Before even reading the product claims I expected this foundation to be really heavy and caky. Because that what’s poppin’ into my mind every time I hear the world “long wear”. 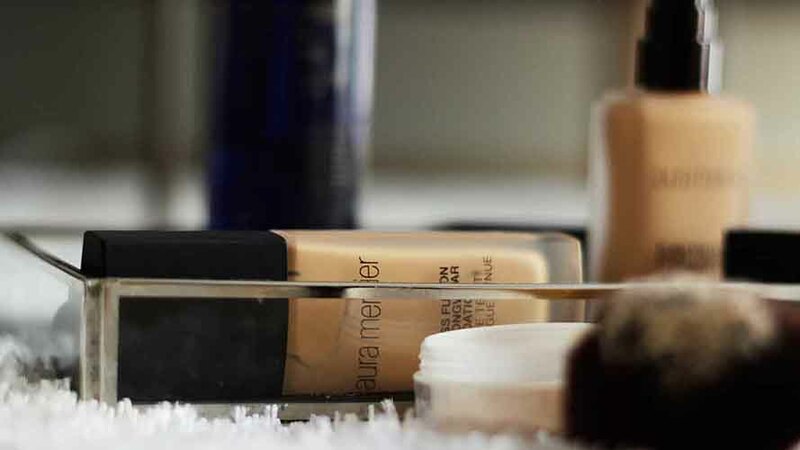 Over the years I found a few foundations from high-end to drug store products that were just right for my skin and I sticked to those brands. One brand is actually Clinique and I thought I would have to stick to one product for the longest time because my skin wouldn’t take all the changing of products. I don’t know if I’m getting old but last summer I realized that my skin condition was changing up not only seasonally but more often. So what I had to do was changing products to adjust to my skin condition. I was not able to do swatches on this foundation and got two different colors that would hopefully match my skin-tone. I’ve tried the Laura Mercier Flawless Fusion Ultra-Longwear foundation in the colors 2W2 BUTTERSCOTCH and 4N1 SUNTAN. Butterscotch has a warm undertone and Suntan has a neutral undertone. I tried both and the weird thing is that they both matched my color. I wasn’t tanned or anything but I think that the foundation just oxidizes and matches the skin-tone while doing that. I ended up mixing the colors and got my perfect shade. 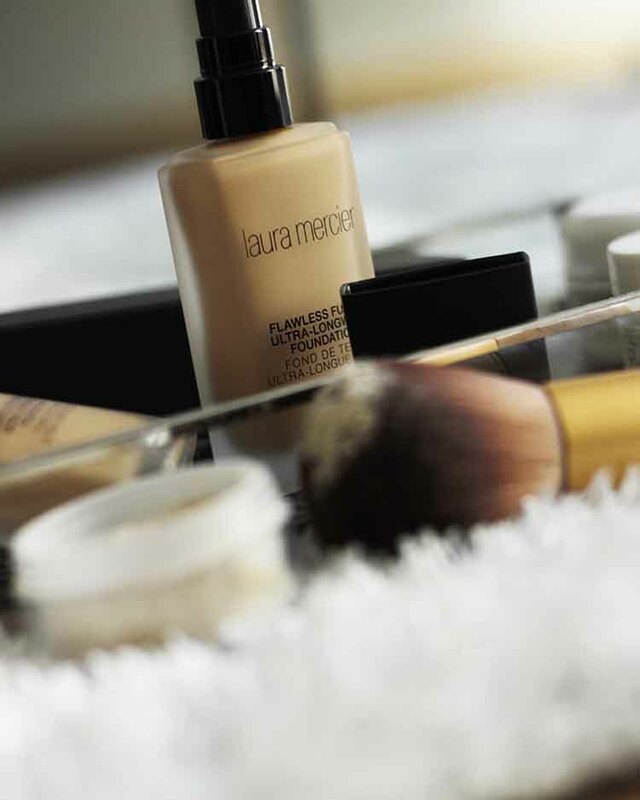 I honestly was expecting to be too lazy to be mixing up the colors every time using the Laura Mercier Flawless Fusion Ultra-Longwear foundation. I sometimes do it and sometimes I don’t depending on what bronzer blush or other products I use – just because I feel comfortable with both shades and the mixed up version. It has a very liquid texture so it spreads out nicely. But it’s not as liquid as other foundations that would make a whole mess in your bathroom. I’ve tried it with the beauty blender and usually I’m more comfortable using a beauty sponge when applying foundation. This time it spread out really smooth and nicely but I wasn’t satisfied with the outcome so I tried using my stippling brush. I really liked the outcome more because it had that airbrush look and didn’t feel like I had to press the product in to my face too hard. Further, if you use a beauty blender for applying the foundation you really have to work fast because it dries down really fast too, which is something that I don’t like when doing my make-up. Once applied one layer it really goes into a matte finish. A matte that just looks like a better version of my skin – not the kind of matte that looks caky and crunchy. I personally think that one layer gives me full coverage, but I’m really not into covering up everything. One layer looks natural but still makes your skin look flawless in a natural way if this makes sense lol. It feels light on the skin and that’s what I really really liked wearing it throughout the day. It really felt like I had no make-up on. My blush and my bronzer glided on really smooth on top of the foundation. What I forgot to try how it looks like with cream products on top. I only used a powder blush and bronzer. So the question is: Does your make-up look flawless after 15 hours? Seriously, it doesn’t. But I think I will never expect a product to be the magic product that makes me look like I just put my make-up on after a long day. I think if people get tired it just shows through their skin, regardless of whether they wear a long wear product or not. But I didn’t look that bad. My face got a bit shiny throughout the day but didn’t end up to look oilly. I just had a dewy look and it wasn’t that matte anymore. For people that really have sensitive skin like me I would highly recommend this product. It is a bit pricey but it will last a long time. I really went from using one pump of the foundation to using a bit more than half a pump (depending on how much coverage you’re going for). It is really light weight I would recommend it for people who wear foundation every day. I think if you’re just using your foundation occasionally you’re good with a drug store product. I will keep on using this product because my skin really didn’t show any negative reaction to this foundation. I’m also not sure if it’s the foundation but my skin really does look a lot better when I’m not wearing any make-up. I also have to say that I’ve changed my night-routine so that could be a reason too. As I said at the very beginning, I like switching up the products I use a bit depending on my skin condition, so I will definitely be using this products for the next months until my skin condition tells me no switch to another product again. I would also consider buying it when mine is empty just because I know that it would really last for a long time.